Charm your way into the annals of history when you wear the Hooded Renaissance Sorceress Gown - Gold and Green. 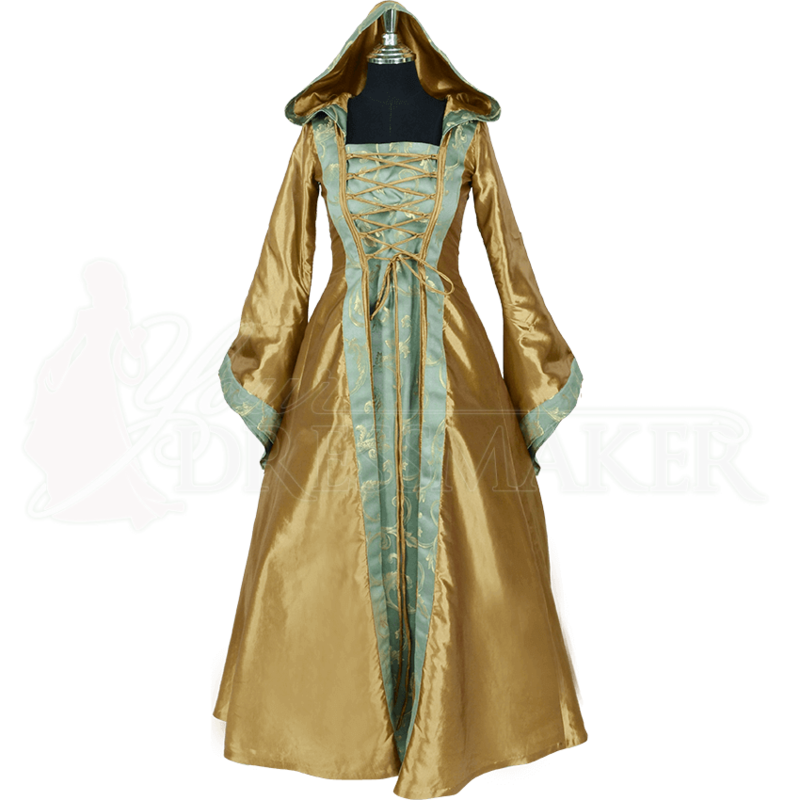 A full, pointed hood and dramatic bell sleeves lend a magical touch to this handmade, historically inspired dress. Regal and sleek, golden taffeta forms the body of the gown. Panels and trim of patterned green brocade add dimension to the overall design. This one piece princess gown achieves a layered look with its green brocade front panel. Adjustable lacing over the bodice of this panel emphasizes the impression, and lacing at the back helps achieve your preferred fit. Green brocade accents frame the sides of the front panel, the edge of the hood, and the edges of the bell sleeves, which can be worn long or cinched up using incorporated cords. Smooth, golden taffeta lines the inside for comfort. Wear this dress with our A-Line Petticoat (MCI-145), sold separately, to give the long skirt the full look shown here.